At Stripes, we bring humility and sincerity to all our interactions with people and projects – we are a production company that provides the best in creative services. We keep our feet on the ground, deal with the problems in front of us, and solve issues one by one as they arise. Our aim is to create a new experience in creative services. Always ready, always natural, always timely. 1. Be prepared to face whatever occurs at any time. Stay flexible to rise to the challenges of a constantly changing society. 2. Act in a natural manner as a matter of course. 3. Always be aware of the ‘speed’ of the business environment, and continue to be a group that faces forward. From the Latin word meaning ‘belief’, ‘intention’ and ‘promise’, credo is a short, general statement of guidelines for corporate activities. But at Stripes, our credo is the bedrock principle for all our activities.Through abiding by our credo, we aim to realize our vision of customer satisfaction. STRIPES offers powerful, effective production control (optimizing budgets and progress management) across a wide variety of media. We also provide bespoke and one-off solutions to individual client requests for video, websites and apps, as well as development services for other platforms. 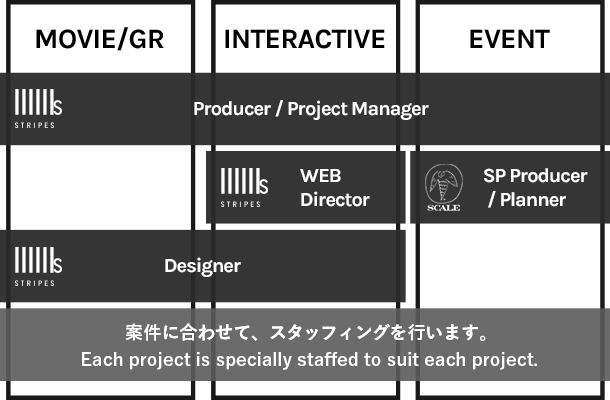 In addition, we have a longstanding collaborative system with our affiliate companies who have an outstanding track record in large-scale projects such as the overall operation and co-ordination of the successful bid for the Tokyo Olympic Games, making us the ideal partner for SP event management.